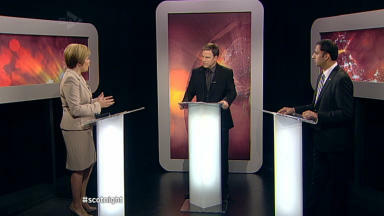 Deputy First Minister and Scottish Labour deputy leader debate welfare on Scotland Tonight special. The two sides of the referendum campaign have clashed in a live television debate on the future of the welfare state in an independent Scotland. Deputy First Minister Nicola Sturgeon and Scottish Labour deputy leader Anas Sarwar went toe-to-toe on Scotland Tonight's debate special on Thursday night. The discussion, presented by John Mackay and Rona Dougall, covered a range of financial issues, including benefits, pensions and taxation. The exchanges reached boiling point over the question of the "bedroom tax", with Mr Sarwar promising that a future Labour government would abolish the reform. Asked about Labour's stance on the policy, which the UK Government introduced as part of its shift to a universal credit system, Mr Sarwar said: "If we had a UK Labour government, we wouldn't have the bedroom tax because we wouldn't have introduced it. If we had a Scottish Labour government, we would have mitigation of the bedroom tax, so we wouldn't have the impact." Pressed by Scotland Tonight presenter John Mackay on whether a future Labour government would repeal the "bedroom tax", the Labour MP replied: "We have been clear. If we were in power tomorrow, we would abolish the bedroom tax." During Prime Minister's Questions on Wednesday, Opposition leader Ed Miliband was invited by Prime Minister David Cameron to declare whether Labour would scrap the policy if it won the next election. Mr Miliband was not drawn on an answer. Mr Sarwar was asked whether his comments were in accordance with his UK leader's policy stance. He repeated: "No, we have been clear that if we were in government tomorrow, we would abolish the bedroom tax." The debate, which aired at 10.30pm on Thursday, was divided into two sections. The first acted as a debate between Ms Sturgeon and Mr Sarwar, moderated by John Mackay. while the second half allocated each politician seven minutes to cross-examine their rival. The exchanges were punctuated by analysis from STV News political editor Bernard Ponsonby and Radio Clyde and Radio Forth political editor Colin Mackay, who joined presenter Rona Dougall in the studio. Both commentators also reacted to tweets from members of the public watching the debate at home. 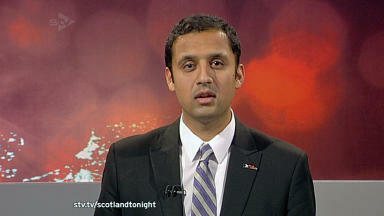 In the first half of the programme, Ms Sturgeon and Mr Sarwar were quizzed on pensions, benefits and poverty. Addressing a report, released on Wednesday, which showed up to one-third of homes in Glasgow were categorised as "workless", Mr Sarwar accused his opposite number of "shy[ing] away from her responsibilities" in government while she maintained that she "want[ed] more powers to do more about it". The second half saw sharp exchanges between the politicians, who both represent Glasgow constituencies. Mr Sarwar accused the SNP deputy leader of "want[ing] to cut taxes for big business and rich people", a reference to the Nationalists' support for cutting corporation tax, while Ms Sturgeon insisted that she "want[ed] Scotland to be in charge" in contrast to the Labour MP whom, she said, favoured "leav[ing] it in the hands of the Tories". Following the debate, political analysts Bernard Ponsonby and Colin Mackay offered their commentary. Both agreed that Ms Sturgeon had succeeded in the first half of the programme but they disagreed on who had dominated the cross-examination section. The Radio Clyde broadcaster felt Mr Sarwar had "got under the skin" of the Deputy First Minister. However, STV's political editor felt a clear winner could not be declared for the second half, which he described as resembling in its raucousness a "stairheid rammy". 6 Sep 2013 Who won the Scotland Tonight debate on independence and welfare?